Eat a Burrito for Bikemore TODAY! Don't forget to trek out to the Inner Harbor Chipotle location today to support Bikemore. From noon to 8pm, half of all proceeds benefit Bikemore if you mention us during checkout. More details over on Facebook. Now this sounds cool. Velocipede is hosting a comprehensive rebuild a bike class. Class is $90 or 9 hours of volunteer time. A mixed payment of money/hours will be accepted. Sign up on Saturday at 1pm. At the end of the sessions you will be the proud owner of a new old bike! Find out more information on Facebook if you are interested. If you missed the Bikemore and Bike Maryland Commuter Workshop last time around, now's your second chance to partake. This time, it will take place on December 7 at Baltimore Bicycle Works. Like last time around, the target audience are those who know how to ride a bicycle, but don't yet feel comfortable riding in traffic. This workshop is free, but please only RSVP if you are sure you can attend. Classroom space is limited! If you're interested, make sure you RSVP here. Join Bikemore for our First Chipotle Day! This seems like an appropriate time to talk about "The Streak." Cal Ripken got all the glory for his streak, but I'd like to think the NFL Films guy could narrate my very own streak if he was still with us. I had Chipotle every Sunday for a couple of years, long enough that I lost count. The Sunday I was double-booked and missed my beloved Chipotle... well, let's just say it didn't end without its tears. You can imagine, then, how excited (honored?) I am that Chipotle is throwing an event to benefit Bikemore. That's right: you get a delicious burrito, Bikemore receives a cut of the proceeds, everyone wins. 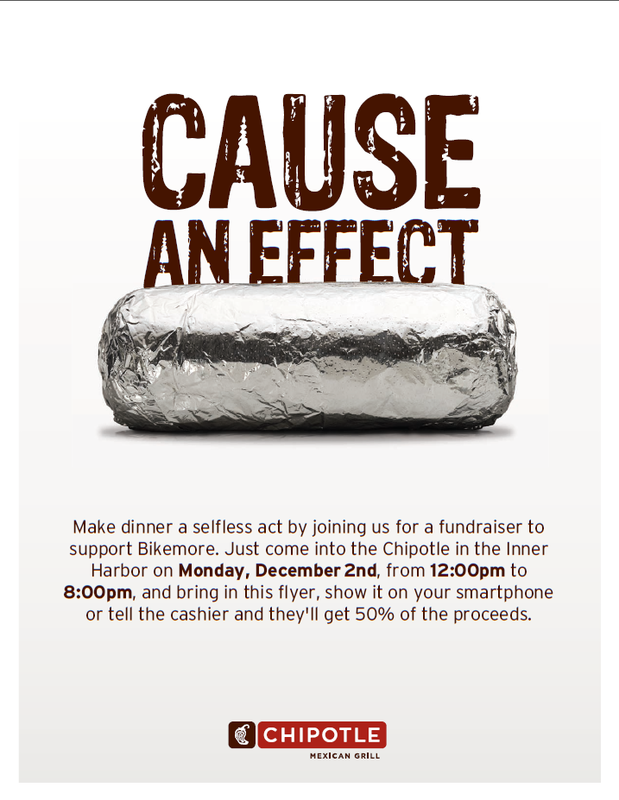 The whole shindig is going to take place at the Chipotle in the Inner Harbor on Monday, December 2 from noon to 8pm. Bring in this flyer, show it on your smartphone or tell the cashier you're there for Bikemore, and 50% of the sale will be donated to Bikemore, for our on-going efforts of improving bicycling in Baltimore. It's that simple -- buy Chipotle, say "Bikemore," and we get much-needed revenue to continue our advocacy and education work. Hope to see you there, and don't forget to RSVP on Facebook and share the event with your friends! Over the weekend, there was a post in the Bikemore Facebook discussion group documenting the illegally-parked city vehicle you see above. This is a friendly reminder that with the Baltimore 311 app--available for Android and iOS--there's a category called city employee complaint. Don't forget to take these pictures and report them to 311.